I grabbed the above screenshot from Hall of Bones, one the adventures I brought with me on my weekend getaway. +Bill Webb makes some very valid points. 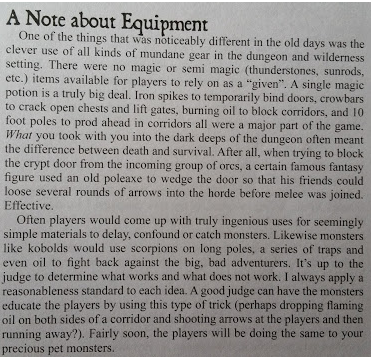 When I started playing AD&D back in the way back, silver and standard rations were always on hand to throw at monsters that might otherwise overpower the party. Iron spikes secured the door to the room the party was resting in. 10' poles were prodding for pit traps and mechanisms. Flaming oil was key (and non flaming for the slip and fall as the party fled) Caltrops - everyone had caltrops. Crowbars were standard issue. The thing is, as Bill says above, when the players improvise the GM must too. Much of what good players will try is not covered in the rules, whether its 4 pages, 40 pages or 400 pages. Personally, I think the shorter the rule set, the more your players are forced to think "outside the book, not just the box." That type of thinking makes for a better game IMHO. Yup. While I prefer the lighter rule sets today, I do miss buying gear down to the last copper for spikes rope and oil. That's why my group cant get away from our house ruled variant of second edition. There's nothing like it. Role Playing and ingenuity is king.